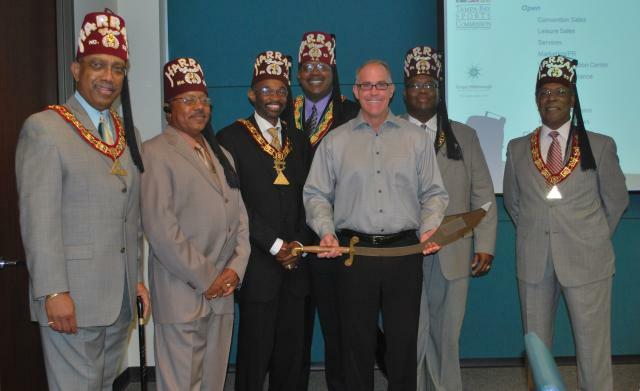 The Tampa Bay & Company office were visited by members of the Ancient Egyptian Arabic Order Nobles Mystic Shrine (AEAONMS) presented Vice President of Sales Norwood Smith with the Moorish Scimitar Sword for his continued support, commitment and dedication to Harram Temple No. 23, Inc. (Prince Hall Shriners). Present on behalf of AEAONMS was the Honorable Past Potentate - Imperial First Ceremonial Master – the Honorable Judge Eric Myers; NOBLE Leslie Miller Jr. – Second Ceremonial Master and Hillsborough County Commissioner (District 3); NOBLE Michael Dozier – Past Potentate and Administrative Assistant to the Imperial First Ceremonial Judge Myers; NOBLE Tony Downing – Assistant Rabban; NOBLE Belton Moody – Assistant Treasurer; and Noble Donald Skillman – First Ceremonial Master. Along with the Scimitar Sword, Smith was also presented with a plaque of recognition and a framed explanation of the history of The Moorish Scimitar Sword. In August of 2010 Tampa hosted the AEAONMS Imperial Session in downtown Tampa. The convention was expected to draw more than 15,000 attendees, producing nearly 15,000 hotel room nights for an estimated delegate spending of $8 million. The Ancient Egyptian Arabic Order Nobles Mystic Shrine is primarily a benevolent, charitable and fraternal organization whose membership is dedicated to the principle of fostering civic, economic and educational development programs throughout the world. To learn more, log on to www.aeaonms.org. Well, that&apos;s all for now but come back for more Tampa Bay conventions and meetings news and updates …until the next time ... Think Tampa!